Is Blaze the Chipotle of pizzas? The fast-casual pizza was conceived, the legend goes, the fateful day in 2011 when Wetzel's Pretzels owners Rick and Elise Wetzel wanted a quick pizza for lunch, but, finding no decent options in Pasadena, ended up in the burrito assembly line at their local Chipotle. So quick! So efficient! Why, they wondered, couldn't there be a Chipotle of pizzas? The Wetzels' Blaze Pizza was the first fast-casual pizza chain, but since then, at least a dozen similar chains have opened, or have been announced (one even from Chipotle itself). It is probably no coincidence that almost all of these chains are based in either California or Colorado, regions not particularly celebrated for their pizza (unless you count the California Pizza Kitchen—where would we be if they hadn't introduced pineapple to the pizza-topping repertoire?—or Beau Jo's "Colorado style," where you're encouraged to dip your crust in honey). In New York they've had "fast-casual" forever, in the form of reheated slices, and in Chicago, we're expected to know that a good pizza is worth waiting for. 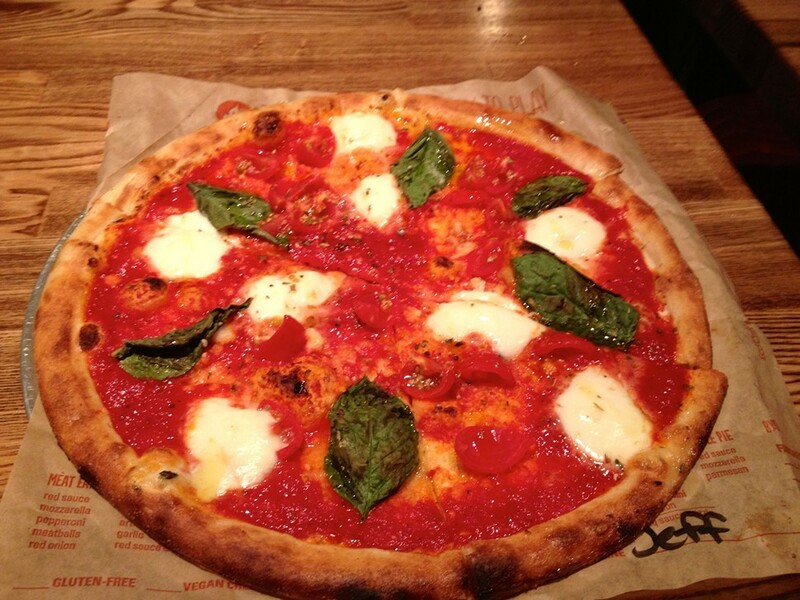 Nonetheless, we've now been given our very first Blaze Pizza, right next to the Belmont Red and Brown Line stop. The assembly line at Blaze does indeed function like a Chipotle. You can either choose from nine "signature" pies or build your own by going down the line and picking out your crust (regular or gluten free), your sauce (choice of six), your cheese (seven, ranging from mozzarella to goat to Gorgonzola and, of course, vegan), and your meat and veggies (the standards you'd find anywhere). Each pizza is 11 inches, enough for one person, and, once you move beyond the one-topping threshold, they all cost $7.95, about the same as a "gourmet" frozen pizza. 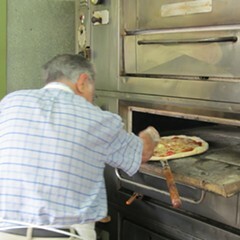 Once your pizza is assembled—the workers behind the counter apply toppings with care and parsimony so that once the pizza's cut, there will be a single piece of sausage on every slice—it goes into a "blazing-hot oven" (temperature unspecified) for 180 seconds. Presumably that sounds faster than "three minutes." Anyway, the idea is that you'll end up with a Neapolitan-style pie with a very thin, blistered crust. And if the line is short and if you eat fast, you'll be in and out of Blaze in the same amount of time it takes to heat up a Tombstone. The good news is that Blaze's pizzas are better than Tombstone's. For one thing, the crust doesn't taste like cardboard. On the downside, it doesn't taste like anything much at all. The red sauce is unremarkable; it has the metallic tang you sometimes get from canned tomatoes. The white sauce is terrible; it adds no flavor, just a gloppy texture to the whole thing. The toppings are fine. There's no grease. It's a nice, tidy pizza. It won't leave you craving more, the way you sometimes find yourself craving Chipotle. In a city full of amazing pizza, it's completely unremarkable. 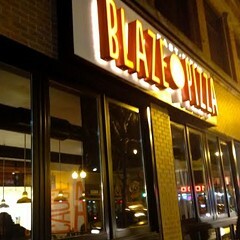 The most remarkable thing about my visit to Blaze, though, was the service. It's annoying and officious: the assembly-line workers call you by your first name as much as possible while interrupting you as you're placing your order and ignoring your every request. It's as if they can't contain their contempt for you for eating here. I felt kind of the same way when I worked at a Starbucks. So maybe they have a point.